It was a foggy morning and the Echo sounder reading had finally come down to two digits after ten days in the Atlantic, an indicator of our proximity to the next port of call, Plymouth. 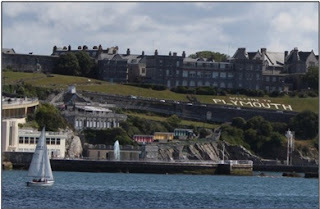 As the ship closed further, the foggy scene turned into an overcast sky and then a drizzle, another indicator of the typical Plymouth weather. This being Tarangini’s maiden visit to Plymouth, the Sea Trainees were scheduled to ‘Man the Yards’ for this seven mile long channel into the Devonport Naval Harbour. The drizzle didn’t help as the already cold breeze turned chillier and the rig got slipperier. A call of “Land Ahoy” from ‘Fore Royal’ turned our attention to the lush green hills and anchored yachts off ‘Plymouth Sound’. Though the winds had been good, the sky had been overcast for the last four days. This beautiful sight was thus a welcome one with the forts and ramparts at the harbour entrance giving an indication of its rich history. The whole skyline was either lush green hills or these medieval looking structures. The seven mile passage of this “White Swan” through the channel, with the yards manned drew quite a few spectators, inspite of the weather. 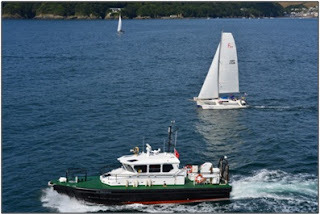 Every yacht or boat that passed, altered course to take a closer look, click a few pictures and wave at the crew. The Bridge Team assisted by the Plymouth Pilot, and the Marine Police boats escorting the ship, had their hands full as the weather, visibility and inquisitive yachtsmen stayed with the ship till she got alongside at Wharf 4 on the Rubble Jetty. The stay ashore is a privilege accorded to the Sail Training Ships as a consideration of their physically tough and demanding work environment. 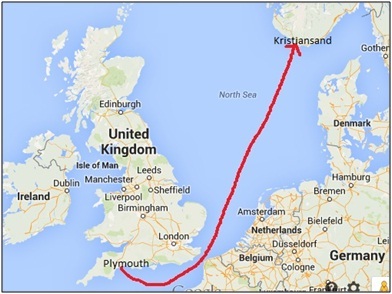 Thus a stable bed where one can stretch his legs is something the crew looks forward to on reaching a port. The stay at ‘Jury’s Inn’ brought all that was desired including sumptuous meals. 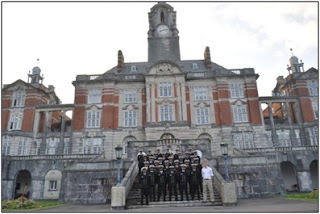 The hospitality and support extended by the City of Plymouth and Royal Navy was reciprocated as the second day brought an opportunity to host local dignitaries onboard for a reception and dinner. The popularity of the ship and the media coverage accorded ensured that the function was a full house. 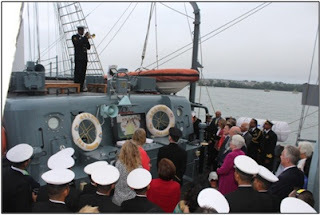 The ship was dressed overall, and the guests were enthralled by performances from the Ship’s Bugler and the Sea Trainees as they enjoyed Indian Delicacies prepared by the ship’s cooks. 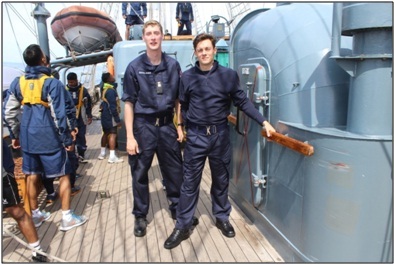 Today as we leave Plymouth and head north to Kristiansan in Norway, we take along Midshipmen Frederich Flood and Christopher Windle. 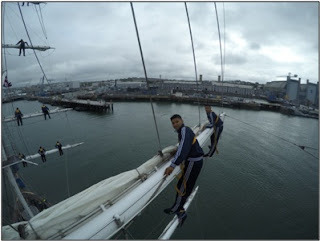 Both the Midshipmen have come from Britannia Royal Naval College and are going to train with our Sea Trainees while we instill the time honoured traditions of courage, camaraderie and Espirit de Corps in these future leaders of the sea going community. 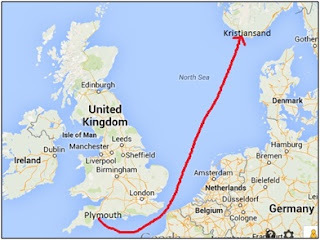 What better way to acquire the proverbial ‘Sea Legs’ and attain the so called ‘Sea Sense’ than sail the English Channel and North Sea on this Tall Ship.